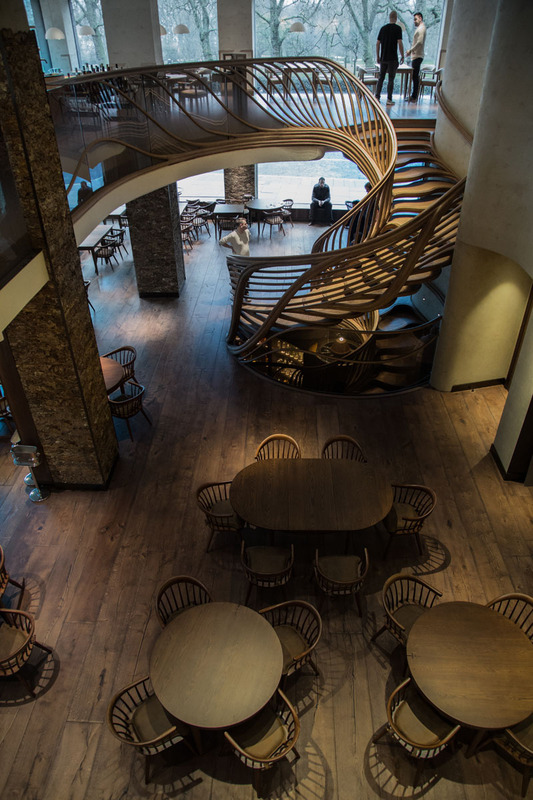 In case you didn’t already know it, the staircase can be an awesome interior design feature and an amazing focal point for homes, offices, restaurants, hotels and pretty much any building with two or more floors. 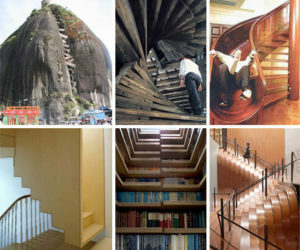 There are many different types of stairs, each with its own unique characteristics and today we’re going to have a look at some of the most interesting and memorable staircase designs from around the world. 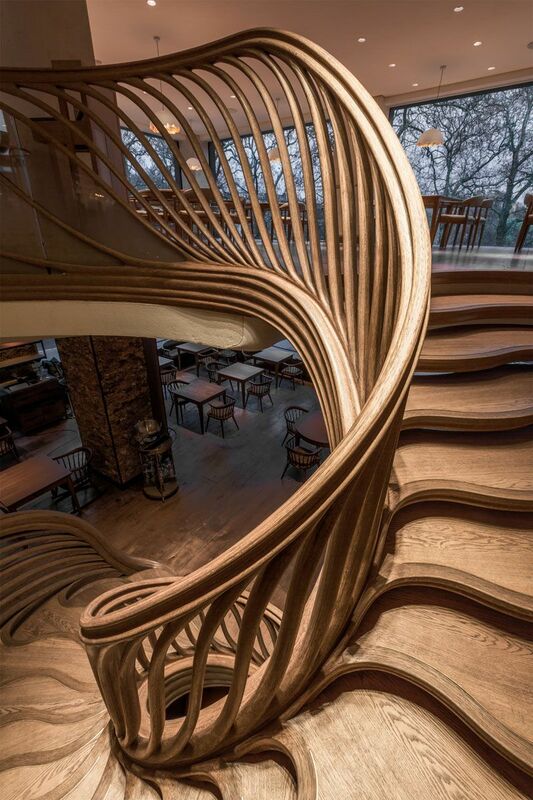 This mesmerizing staircase was designed by studio Atmos and can be found inside the three-storey HIDE restaurant from London. 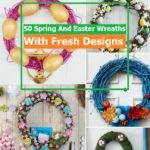 It looks like a surreal sculpture, with each step melting into the next one and with a truly unique design from all points of view. If you’re ever in London you absolutely must check out this restaurant. 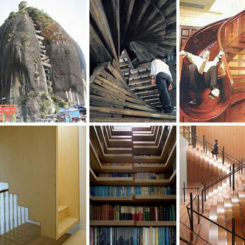 Hopefully, the food will be as breathtaking as this staircase. 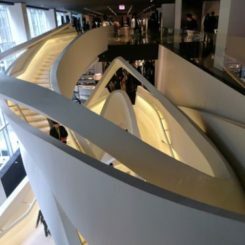 Apple is known for its love for everything simple and for an inclination towards smooth curves and perfect harmony between all the different pieces that form a design so we’re not at all surprised to find out that one of the Apple stores has an amazing staircase that reflects this ideology. 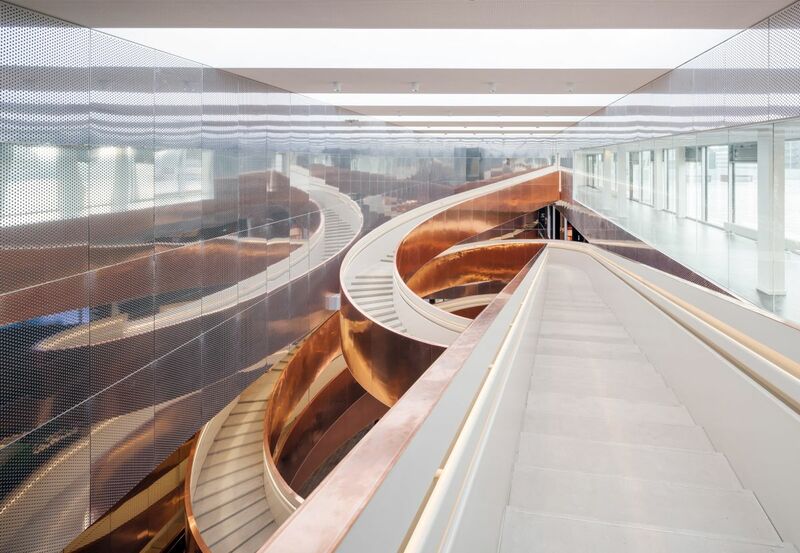 This is the flagship store from Singapore and the interior, staircase included, is designed by architectural firm Foster + Partners. 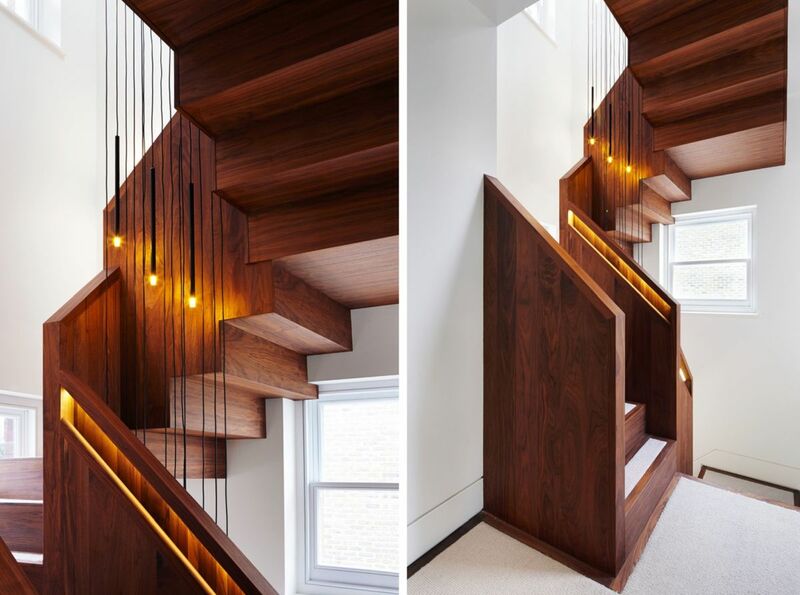 Even a small feature like built-in handrail lighting can make a big difference in the design of a staircase. 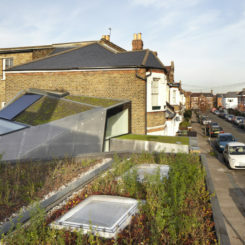 This one was designed by Fraher Architects for an apartment which they renovated in London. 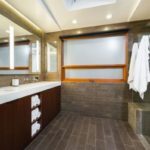 The hidden lighting light strip has multiple advantages, both aesthetic and functional. 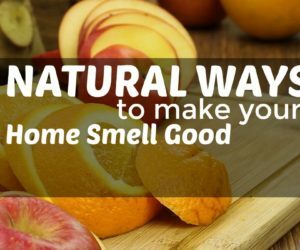 It improves safety plus it looks amazing, highlighting the unique pattern on the wood and its beautiful coloring. 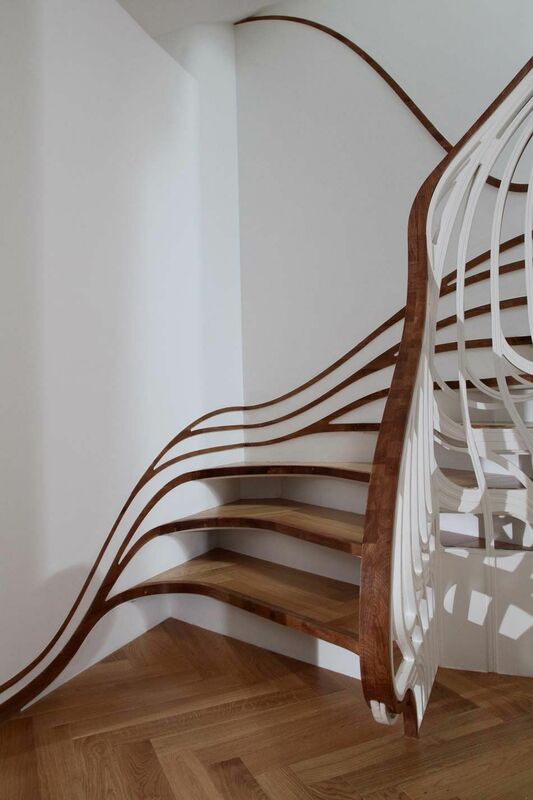 This spiral staircase may not look like much but there’s a very interesting story behind its design. 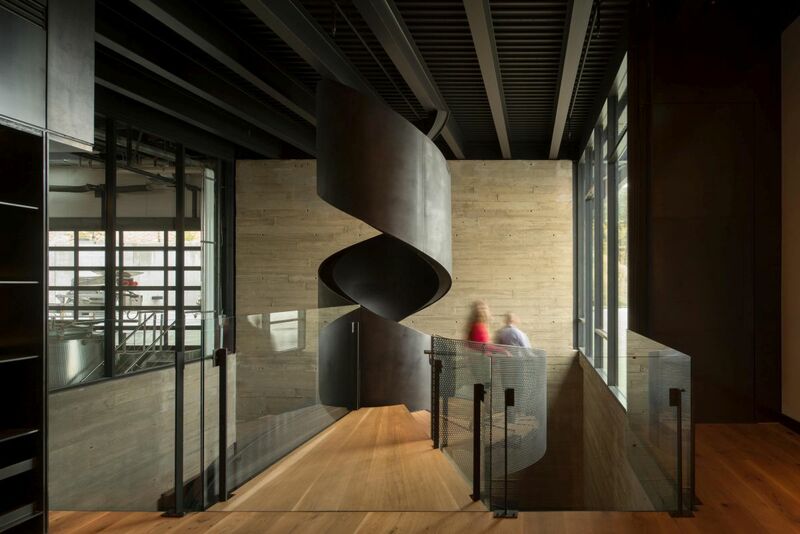 You can find inside the von Mandl Family Estates winery designed by architect Tom Kundig. 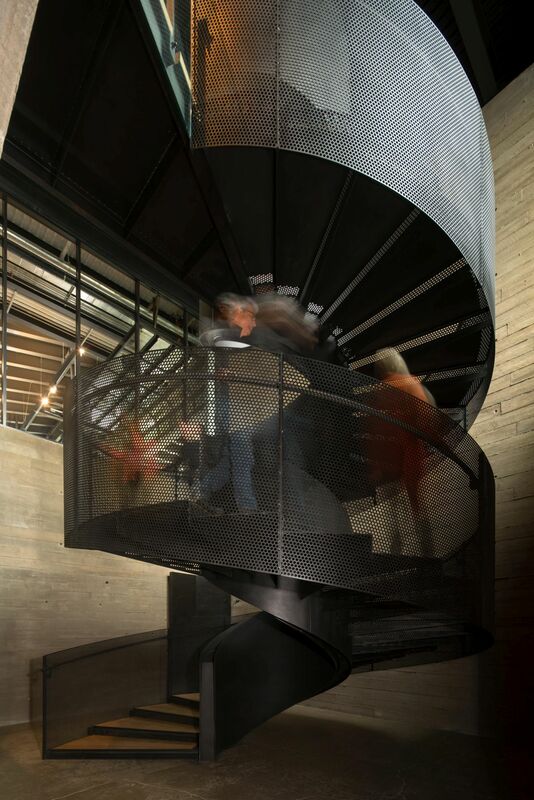 Visitors enter through a concrete tunnel into a private tasting room and from there a spiral steel staircase leads up to a larger space. 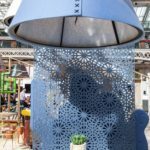 The staircase features perforated steel on the outside and solid steel at the core and its design was inspired by the filtering equipment used in the wine industry. 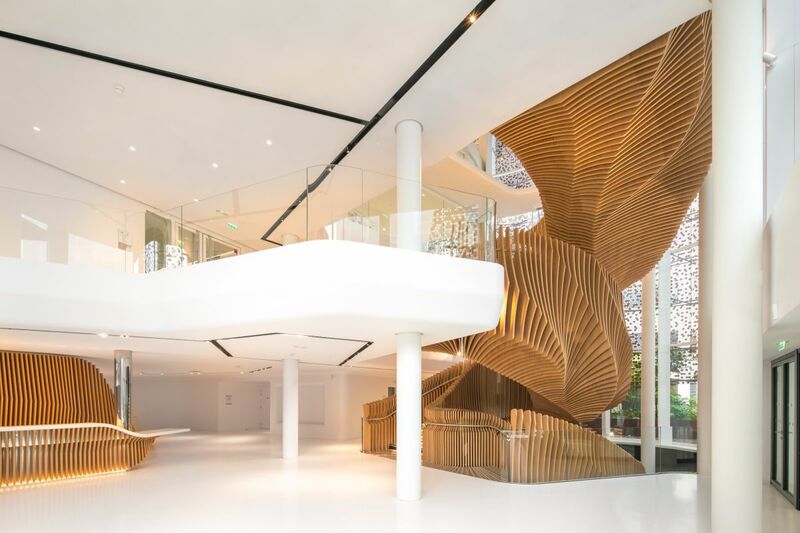 This amazing staircase is the centerpiece of the new office that architect Ora Ito designed for LVMH’s media division in Paris, France. 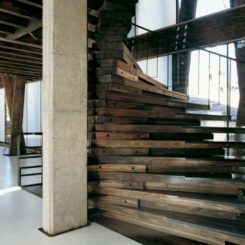 The office has four floors and an interior that’s minimalist and neutral, except for this soaring staircase of course. 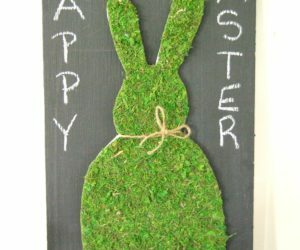 It’s sculptural, eye-catching and also quite huge. 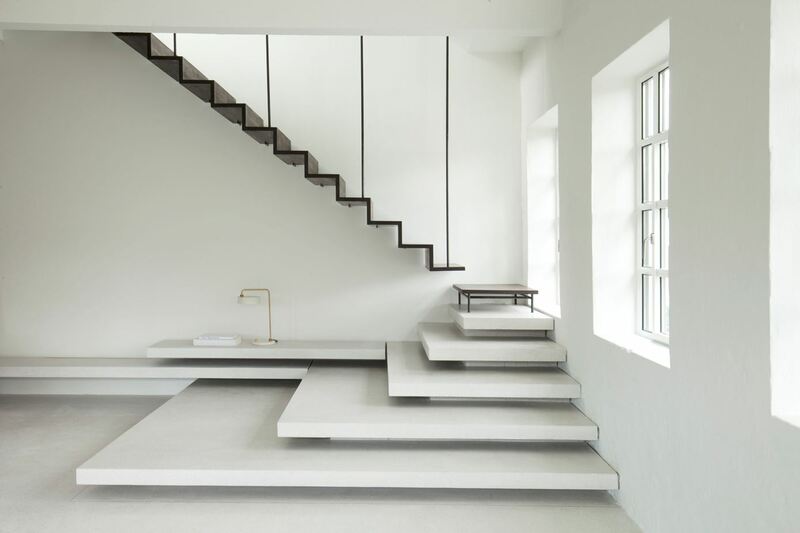 Minimalist staircases can be interesting too. 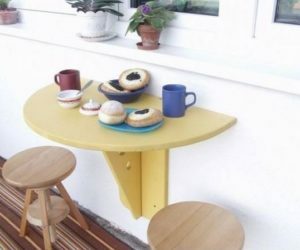 This one, for example was designed by Bell Phillips Architects for a newly refurbished apartment in Hackney, North London. 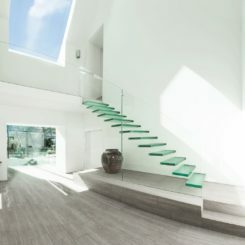 The idea here was to create a staircase which doesn’t take up much space and which maintains an airy and open feel around it. 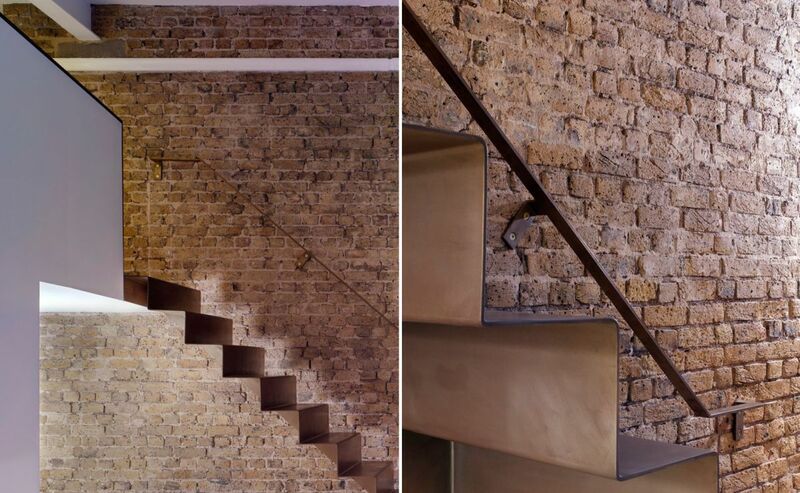 The staircase has to stand out and to blend in at the same time and to make that happen the architects made it out of 6 mm thick steel sheet which was folded and welded and then sprayed with atomised brass. Subtle accent lighting highlights its slender figure and geometric shape. The Experimentarium is a science centre located in Copenhagen, Denmark. 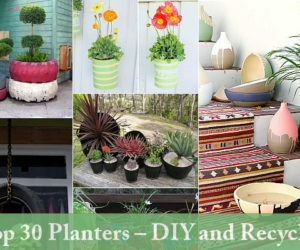 A while ago it went through a complete renovation and refurbishment process. 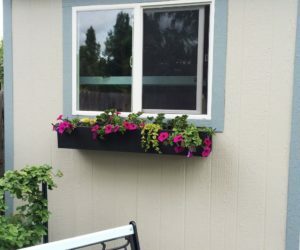 An international competition was held to determine the studio in charge of the project. 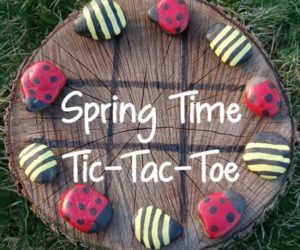 The winner was CEBRA. 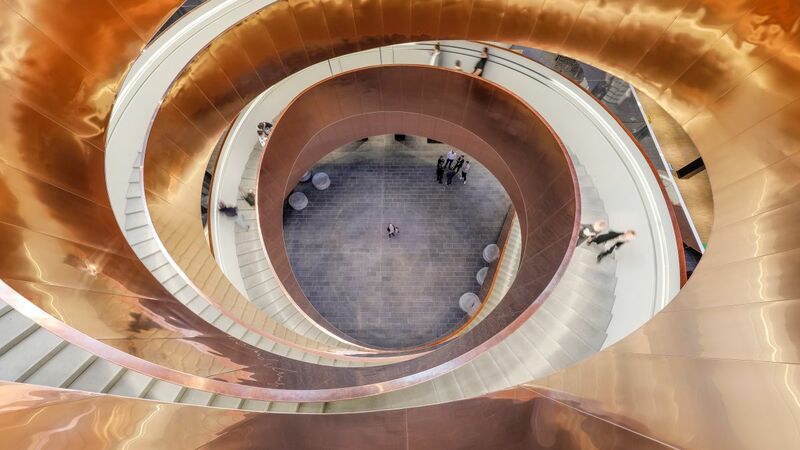 Among the additions and changes done to the place we should mention this amazing, copper-clad helical staircase which was inspired by the structure of the DNA strand. 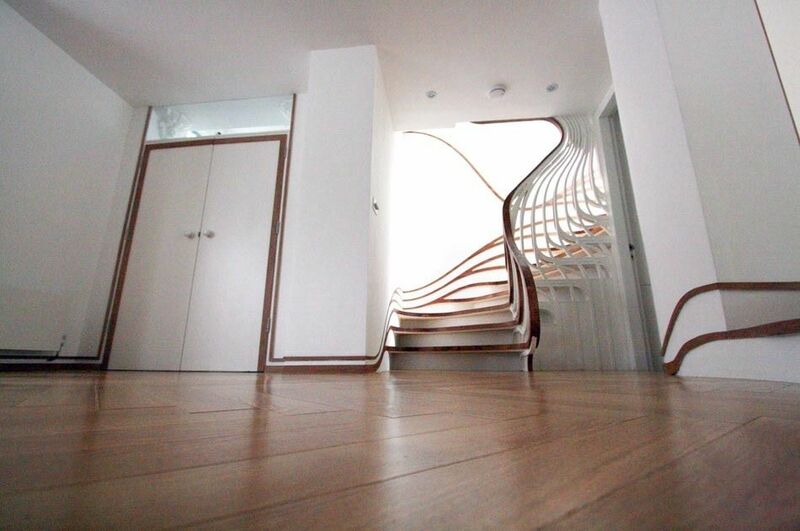 Sometimes a staircase is more than you’d expect from it. 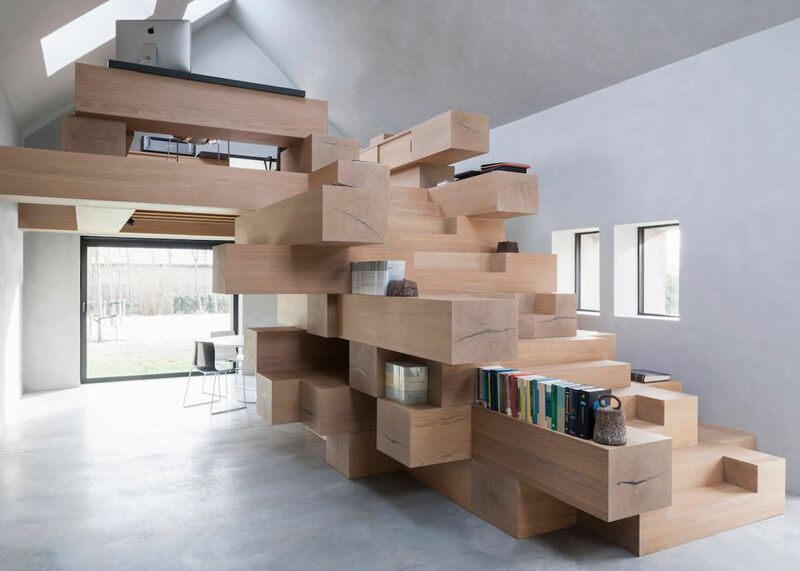 A perfect example is this unique structure designed by Studio Farris Architects for a barn which they converted into a modern office space in West Flanders, Belgium. 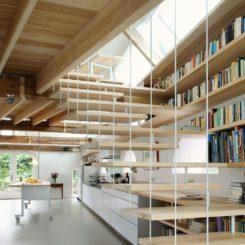 The staircase is in fact a multifunctional structure made out of stacked timber beams. 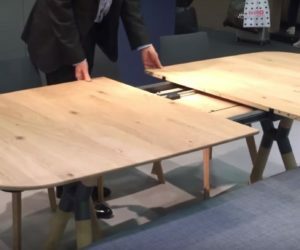 They form shelves, storage nooks and seats as well as two desks on the mezzanine floor. The new Norwich University of the Arts School of Architecture from England is housed in a very special building. 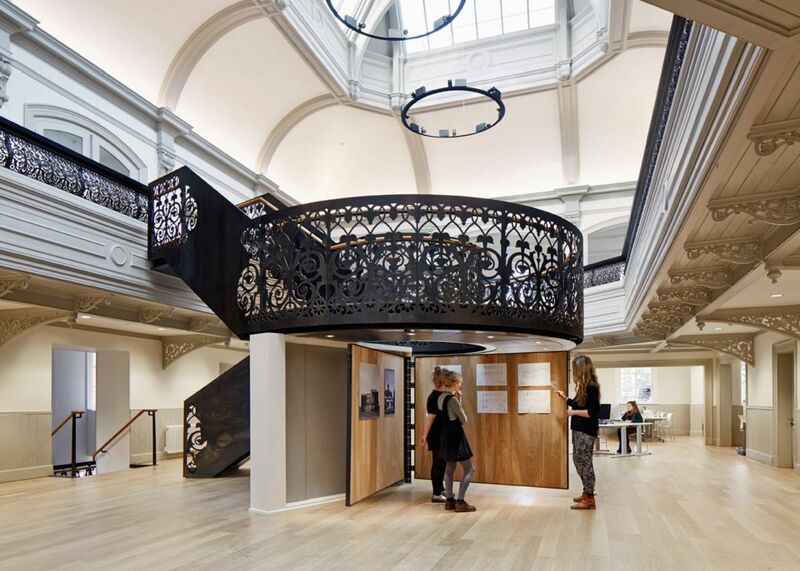 It’s a grade II listed Victorian structure built in 1879 and it’s been transformed into an amazing and very inspiring space by Hudson Architects. 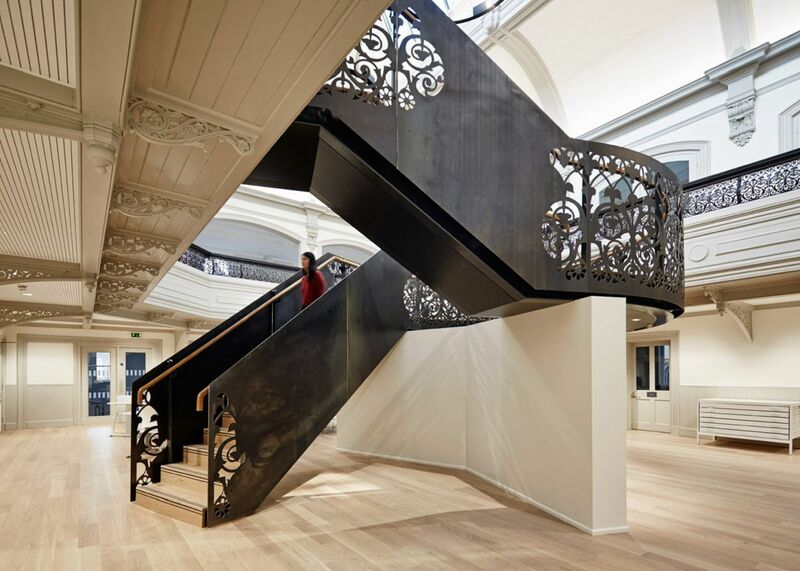 One of the most gorgeous features is the staircase which features intricately etched surfaces cut using a water jet. 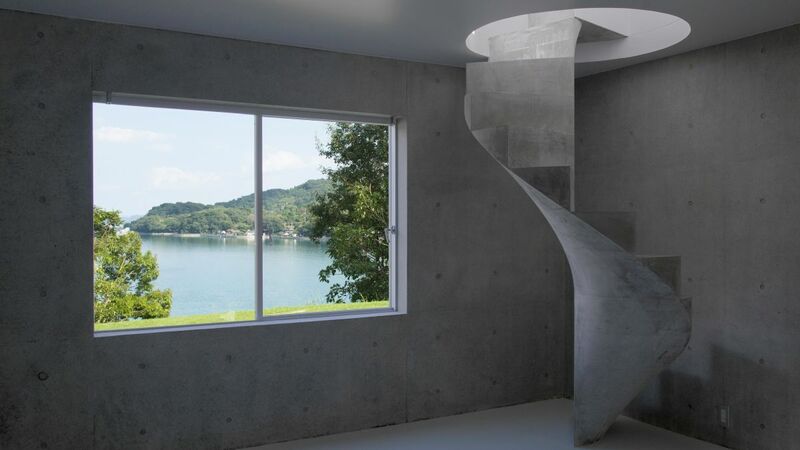 When designing this house from Hiroshima Prefecture in Japan, Kazunori Fujimoto Architect & Associates structured it into two concrete cubes placed on a concrete platform. 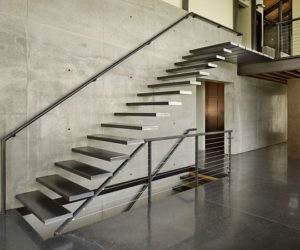 As far as the interior is concerned, the design is minimalist and concrete is the primary material. 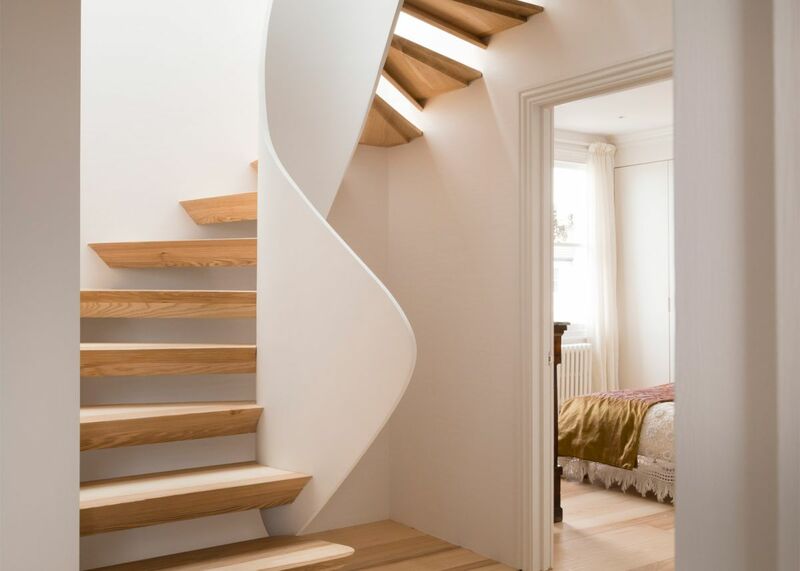 One of the collect features about this split-level house is this spiral staircase which connects the bedrooms and the living space. 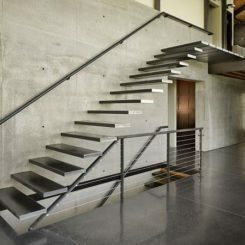 It’s made of cast concrete and it has a very steep and sleek look. 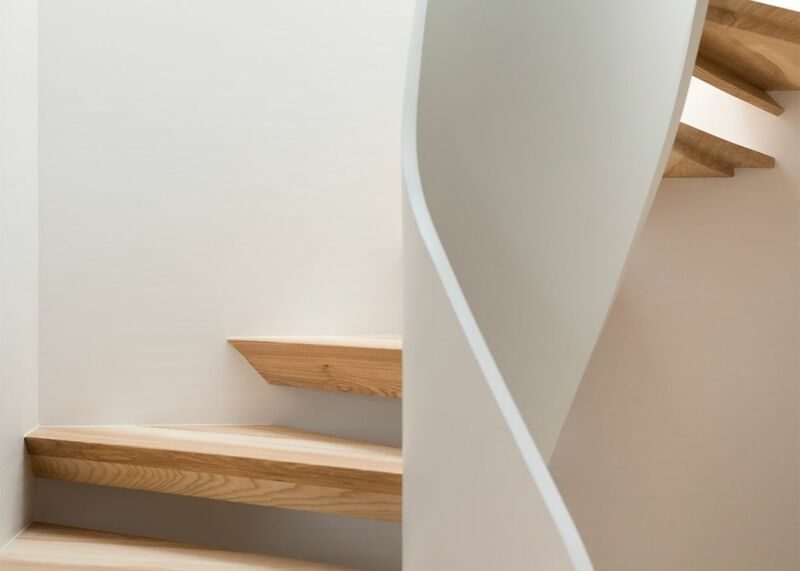 When studio 51 Architecture was tasked with the renovation of a family home from Hampstead, London, one of their objectives was to replace the original staircase at the center of the space with a more space-efficient and stylish one. 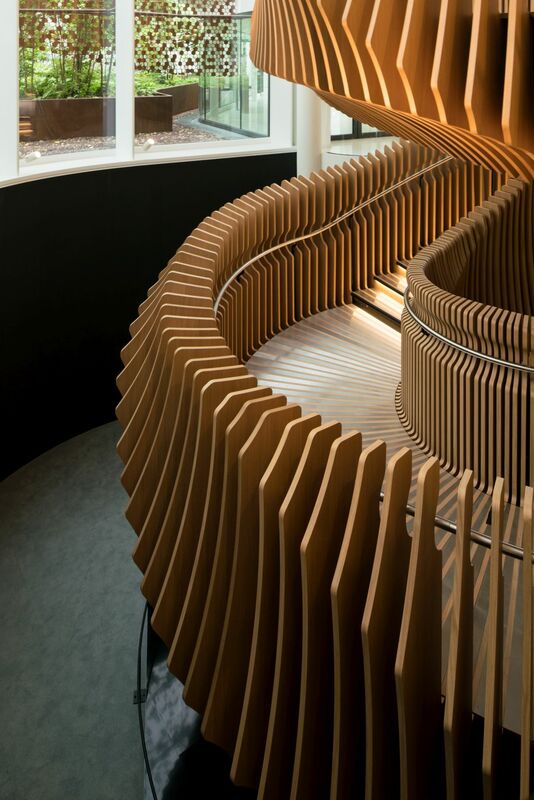 They came up with this light and elegant design which features beveled wood steps suspended between the walls and the undulating central support. 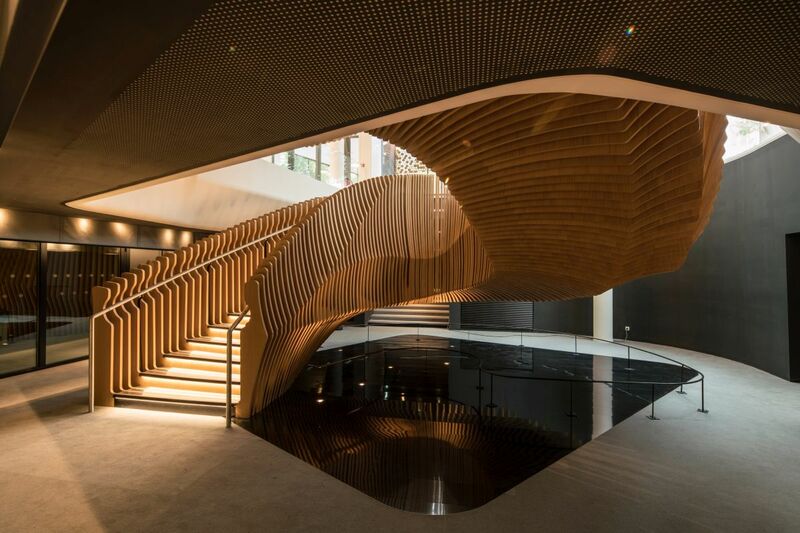 Speaking of undulating staircases and light and sculptural designs, check out the Sensualscaping stairs designed by atmos studio. 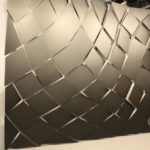 They’re created by combining digital production and fabrication methods for a residential project. 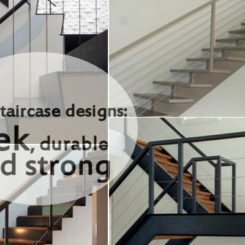 Each step looks like a continuation of the skirting board lines which undulates and becomes a part of the railing. It’s like this staircase has melted and has become one with the wall. 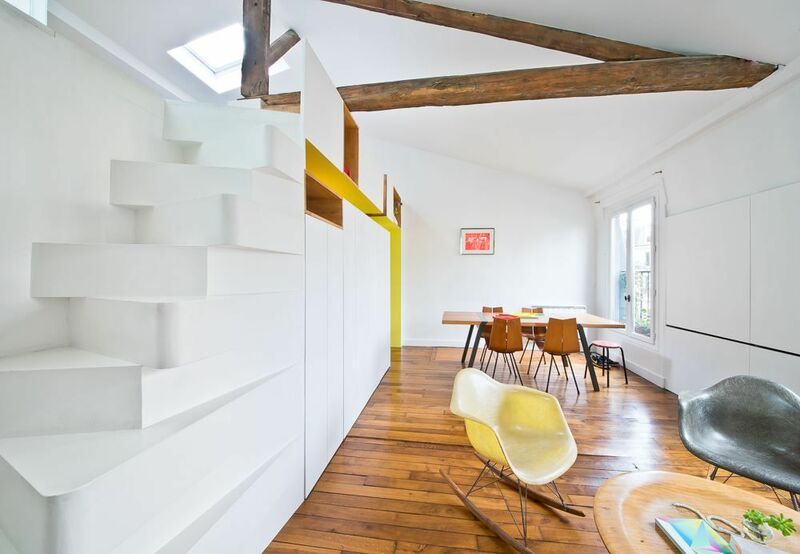 This is the interior of an apartment from Paris which was reimagined and redesigned by SABO project. 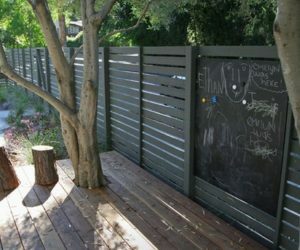 The studio made a few drastic changes to the space such as removing several partitions and adding new features, including this multifunctional wall which includes an alternating thread staircase as well as several other elements. 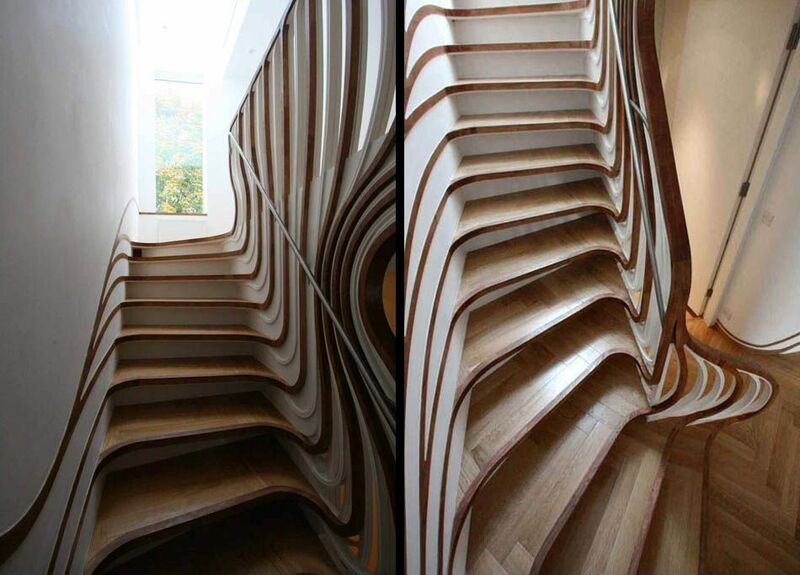 This sculptural and minimalist staircase is structured into two separate and very different sections. 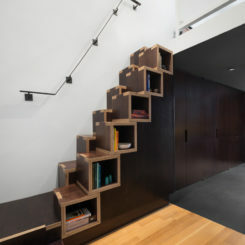 The main section is a floating staircase with a very thin, sleek and graphical appearance and the other part is the base which has a series of large steps which intersect with the floating shelves at the bottom of the staircase wall. 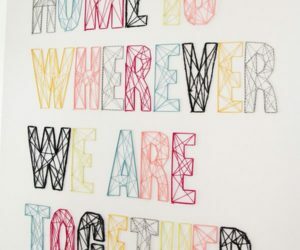 This is a design done by JAC studios for an apartment in Copenhagen. 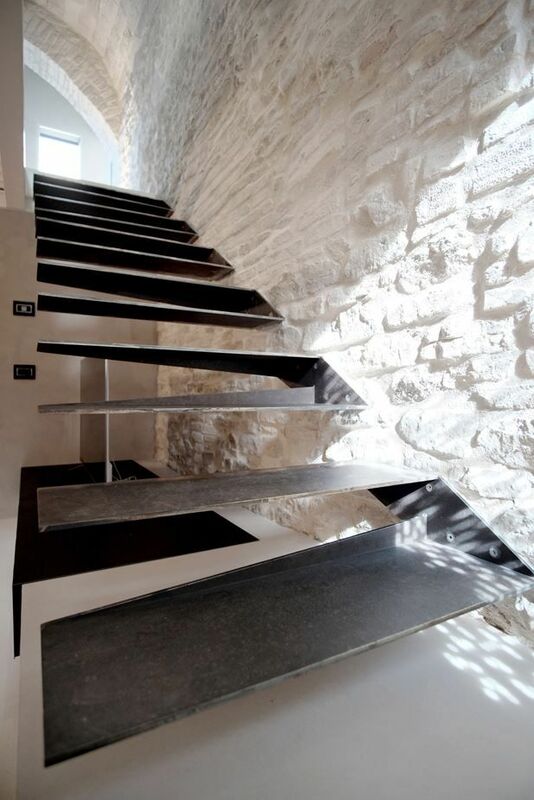 Floating stairs often stand out and look amazing, but rarely in a way as dramatic as in the case of this residence from Italy designed by architect Matteo Avaltroni. 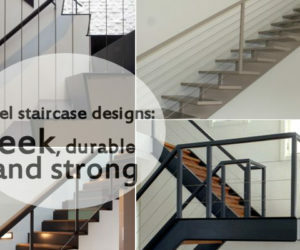 The stairs are grouped into sets of two and have sleek, geometric designs. 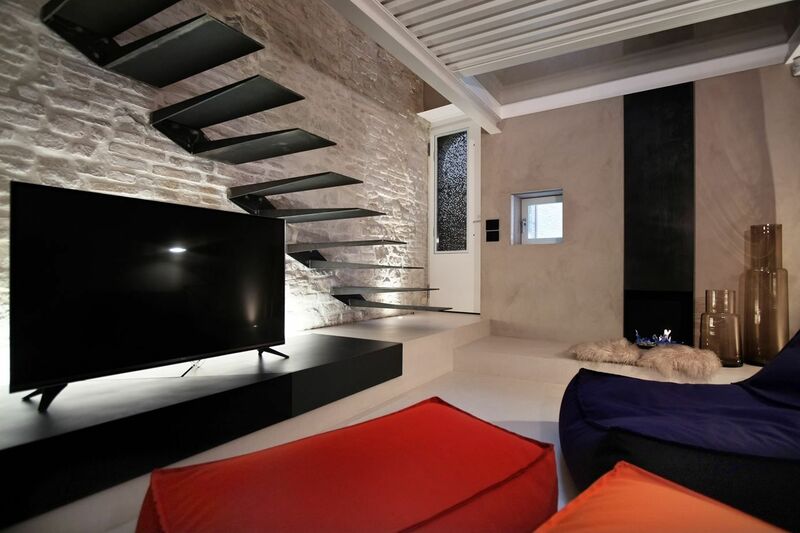 They’re floating onto an exposed brick wall in the living area and a large TV is placed just below them. 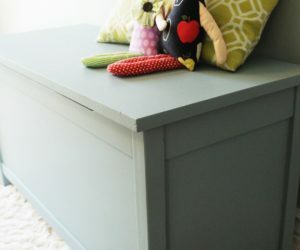 This is a form of under stairs storage but in a rather general sense.